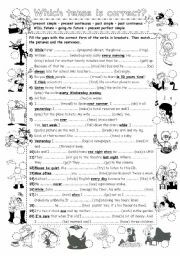 Revision of tenses. Students fill the gaps with the correct form of the verb in brackets (past, present, future). Then they match the sentences and the pictures. Thanks to Olia for the inspiration! The key is included. BW version also available. 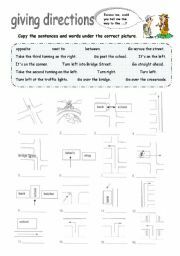 A useful worksheet for students to keep a record of the most useful phrases for giving directions. 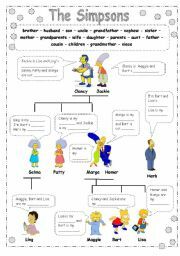 A worksheet for the presentation of the vocabulary for family members. 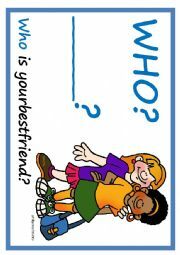 Students read the speech bubbles and then decide which word fits in the gaps. All the words are given. They use each word only once. 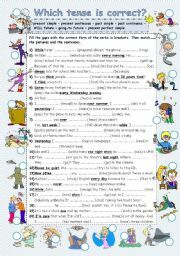 Revision of tenses. 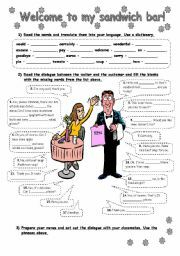 Students fill the gaps with the correct form of the verb in brackets (past, present, future) and then they match the pictures and the sentences. Thanks to Olia for the inspiration! The key is included. Colour version is also available! 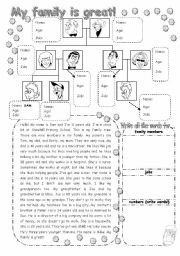 This is an easy reading worksheet for elementary/young students. They read the text and then complete the family tree. There are also some questions about the text to practise questions words and of course to check the understanding of the text. I hope it�s useful. The first set of large flashcards for the teacher. 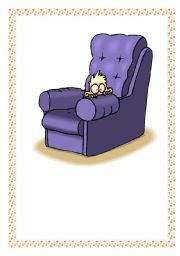 Find the other set, which also contains words for the back of the flashcard, and of course find cards for students. Have fun!